Situated centrally within the city, the Kosmos Hotel Karlovy Vary provides close access to diverse attractions. The city’s famous spas and mineral springs are located near the center of the city. There are also numerous commercial addresses located in the center of the city. Guests may easily bike or walk to other parts of Karlovy Vary. Guests may travel to Karlovy Vary via air, rail or bus. The Kosmos Hotel Karlovy Vary may be reached via the city’s airport or guests may make the 3 hour rail or bus trip from Prague. 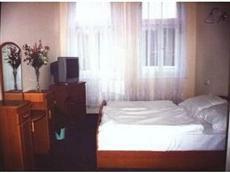 All of the rooms at the Kosmos Hotel Karlovy Vary have access to room service around the clock. The hotel also provides televisions with satellite programming and a private bath to all of its guests. There are showers in the private baths. There are amenities suitable for those who arrive on work-related matters in the hotel’s business center. The Kosmos Hotel Karlovy Vary also offers its guests a restaurant. There are safety deposit boxes available at the hotel. Guests may bring pets to this establishment.